Over recent seasons the Wharfedale faithful have become used to seeing their forwards steamroller opposition teams. Even when the Green back line has been misfiring, the sight of the front eight rolling towards the try line at the Avenue has often been enough to stir the crowd and steal the victory. Times change. On Saturday, it was the turn of the Green pack to be on the back foot, as their Otley counterparts gradually took a stranglehold on the match, running out narrow winners in a fiercely contested local derby. Playing up the hill in the first period, Wharfedale edged the early exchanges, running the ball back at Otley at every opportunity. There was an early sign of what was to come, though, when Otley won a scrum against the head in the first ten minutes. The deadlock was broken in the 16th minute when Rhys Lovegrove charged down an Otley clearance. Will Bell made a break, for Dan Stockdale to run in under the posts. Tom Mann made the conversion. Otley got onto the scoreboard 3 minutes later when Dale were penalised for not rolling away. Worse was to follow for the Greens, when shortly afterwards Rian Hamilton was sin-binned for a deliberate knock on. Otley were now in the ascendant, and twice came close to scoring. On the half hour a poor Dale clearance gave the visitors the chance to spread the ball wide and counter. A superb chip and chase led to a try for Oliver Goss. With the try remaining unconverted, Otley held a one-point lead. This looked like being the score at the interval, until a move of multiple offloads saw Tom Mann run in for the Greens on the stroke of half-time. This was one of the finest tries the Avenue has seen in seasons. With the slope and breeze in their favour, Wharfedale would have felt confident going into the second half. Straight after the break Rian Hamilton almost scored, but was deemed to have knocked on in goal. At this point Otley’s pack asserted their authority. On 51 minutes their lineout drive, which Dale had problems defending all afternoon, led to an unconverted try for Brett Mitchell. Minutes later Otley broke again, and from the chip and chase, Will Bell was yellow carded for obstruction. Joe Rowntree kicked the penalty, to take Otley into a two point lead with twenty minutes remaining. This was to remain the final score, and through most of this period it was the visitors who looked more likely to add to their tally. But with minutes to go, Dale eventually broke clear through the impressive Rian Hamilton. It was the Otley defence that had the final word, though, forcing a Green knock on after an agonisingly tense final play. This was a top-class local derby, which offered great entertainment to a bumper crowd. And although it was the Otley contingent that left with smiles on their faces, Wharfedale supporters should not feel too downcast. The Greens played with faultless commitment all afternoon, and in open play, the verve of their attack was thrilling to watch. Nor should we forget that only two weeks ago, against a strong Sedgley Park team, the Wharfedale pack was in the ascendant. The absence of key members of that pack inevitably weakened the Greens against Otley, but those absences are temporary. Otley’s classy performance reminds us that there are a number of closely matched teams in our league. Hull Ionians’ loss to Hinckley yesterday carries the same message, and suggests that we should travel across to the Humber next weekend with hope. 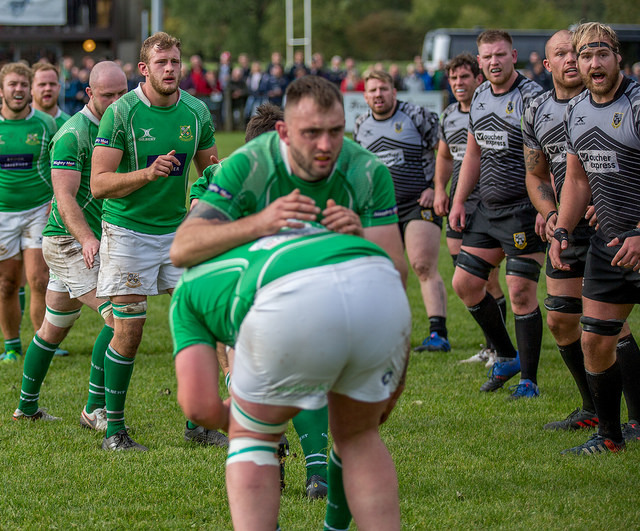 Wharfedale team: – Tom Mann, Rian Hamilton, Ben Parkinson, Rhys Lovegrove, Oli Cicognini, Will Bell, Sam Gaudie (Phil Woodhead 53), Joe Altham (George Martin 64) (Joe Altham 75), Dan Stockdale, Reece Ward (Sam Booker 53) (Reece Ward 68), Ben Leacock (Chris Walker 75), George Hedgley (c), James Tyson (Matty Houghton 23), Chris Walker (James Tyson 64), Josh Burridge. Replacement not used: – Josh Prell.